As mentioned in a previous post, I have a LinkedIn profile. LinkedIn is a network for business professionals. It’s a good way for a freelancer like myself to make connections and attract potential clients. This year, LinkedIn gave members a new perk: they could write posts on the LI platform at no charge. A great way to demonstrate one’s knowledge and expertise. Here’s my latest LI post. It has a humorous premise (we can learn something from a messy wild west shootout), but I think the lessons hold true. See if you agree. You can also read the post on LinkedIn. The Gunfight at the O.K. Corral. The most famous shootout in the history of the Old West. It took place on October 26, 1881, in Tombstone, Arizona Territory. The Earps won, the Clantons lost. It teaches me, a freelance illustrator, 7 important lessons. The lessons are the same, no matter what product or service you might offer. 1. Legend (and the movies) say the Earps were the good guys. It’s more muddled than that. Muddled enough that the Earps were tried (and acquitted) for murder after the shootout. Lesson: Don’t be so quick to judge, to immediately categorize people (clients, customers) as good or bad. Use good sense, judge people by their actions over time. But keep an open mind, and give people a chance. You might just pick up a loyal friend and customer for life. 2. The entire gunfight lasted about 30 seconds. Lesson: Be prepared for a life- or career-defining moment. Be alert for a window of opportunity, and seize the moment. Such windows may be open for only a very short time. 3. Wyatt Earp was the only “good guy” who wasn’t hit in the shootout. He outlived everyone else in the fight, and died at age 80 in 1929. 4. The gunfight did not actually take place at the O.K. Corral. It took place in a narrow lot next to Fly’s Photographic Studio, six doors west of the rear entrance to the corral. Lesson: Never take “facts” for granted. That includes the specs for a design or any other job. The client may be mistaken, misinformed, using the wrong terms, and/or doing some wishful thinking. Be proactive: do the research, ask questions, fill in client knowledge gaps. In short, bring your expertise to bear. It’s part of the job, and crucial to successful results. 5. Town Marshall Virgil Earp deputized Doc Holliday on the morning of the gunfight. It was Virgil, his brothers Morgan and Wyatt Earp, and Holliday who faced off against the Clantons. Lesson: Know when to ask for help– and ask for it. You need to make connections, and stay in touch. You’re ready to help them, they’re ready to help you. 6. Two members of the Clanton gang ran from the fight when the shooting started. Lesson: Speaking somewhat facetiously: they recognized they were not a good match for the job, and turned it down. That’s excellent advice for an artist or anyone else: we all have our specialties. It’s a mistake to try to be all things to all people. Recognize when a job is a bad match for you, and politely decline. If you can, recommend a colleague who is a good match for the job. Perhaps said colleague will return the favor one day. 7. The gunfight did not become famous until 1931, when author Stuart Lake published a largely fictitious biography of Wyatt Earp. Movies and television have since raised the gunfight to the level of myth. Lesson: You never know when something’s going to go viral. You never know when you and your work might be discovered. Be ready. Practice, put in the time, stay optimistic, and always, always do the best work you possibly can. Mark Armstrong is the Chief Sketch Officer at Mark Armstrong Illustration. He’s a Photoshop expert, and has been in business for over 25 years. He believes there’s always a visual component to any communication problem. He uses illustration and humor to help solve those problems. You can view his profile in slideshow format. Were you familiar with The Gunfight at the O.K. Corral? Can you think of other historical events where the “movie version” is a lot more glamorous than what actually happened? Did the seven lessons ring true? Was there one in particular you especially liked? This year, LinkedIn gave members a new perk: they could write posts on the LI platform at no charge. Ahhh, now I see why you’re cross-posting. Nice! Hi, Jak! Why did the chicken cross the road? To get to the other side. Thank you for that lovely comment, dear Linda! As you know, I am (quite seriously) a big believer in the power of humor to capture attention and put people in a receptive mood. That makes humor a powerful teaching and marketing tool– and a natural ally for any business. So that’s how you learned to finger paint so well. I knew there was a reason! And thank you for your kind words, it’s an honor to be one of your favorite humor writers, truly Mark. You’re an inspiration. You had a dream and went after it armed with nothing but your gift for cartooning and your sense of humor and possibly your kindergarten teacher’s six-shooter, but still! The point is you did it! Have you ever thought of writing a book on how you did that? I think there are thousands if not millions (maybe even trillions, but probably not) of others out there who would love to know how you did it. And of course you could generously pepper it with your illustrations. 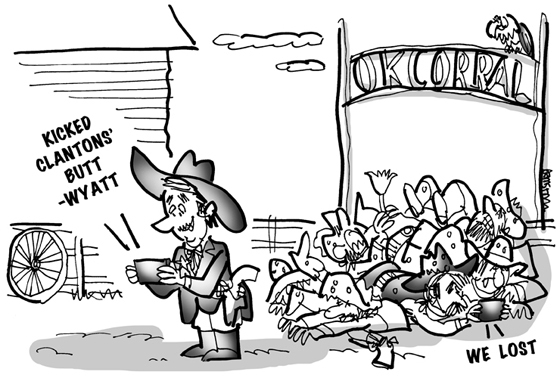 Very much like the OK Corral post. This was a really clever post! My favourite point was lesson 3 – to work hard and prepare yourself so that you’re ready when your lucky chance comes around. I’ll be keeping that and all the other lessons in mind! Glad you enjoyed the post. “Luck” is an interesting concept to say the least. I can think of quite a few people who ascribe others’ success to some bolt-from-the-blue lucky break. They ignore the fact that most of those people have been perfecting their craft, taking chances, knocking on doors, and making their pitch. If and when that window of opportunity pops open, they’re ready. No guarantees, of course. Maybe they’ll succeed, maybe not– but they’ve worked hard to boost the odds that they will be successful. “Were you familiar with The Gunfight at the O.K. Corral? No I’m not familiar with any gunfight. But I learned something here. As for movies, I don’t watch them much. So umm…trying to dredge up my memory. Yes, those lessons ring true. Wonderful analogy, Mark. But it was a short time event, that changed how I viewed my “luck” from not being permanently injured /disabled. And not to take life and my good health for granted. Hence, I bike. And get this, I was struck in front of life insurance headquarters building. Um…actually Jack’s business partner was shot by a cyclist in front of his own bike shop in Vancouver. THis past June. It made national news. It was disgruntled ex-employee….who actually tried to escape by bike afterwards. But the police caught up. Thanks for sharing those remarkable anecdotes. Thanks for moseying into the Armstrong Saloon and leaving a comment!